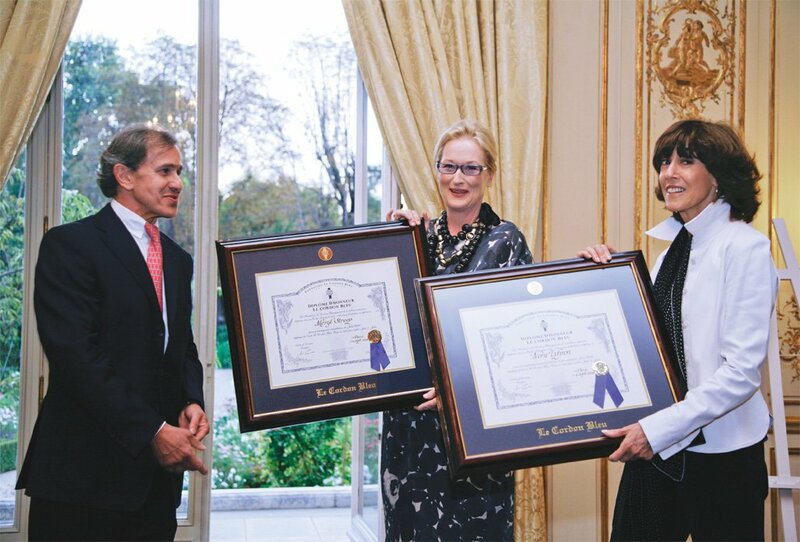 The 2010’s French Food Spirit Awards are attributed to the American actress Meryl Streep (Culture Award), the Italian microbiologist Paola Bonfante (Science Award), the American Cheese Expert, Max McCalman (Entrepreneurship Award) and to Ariane Daguin, Founder and CEO of D’Artagnan Inc (Special Jury Award). The four outstanding personalities were selected by the international jury of the French Food Spirit Awards for their contributions to international understanding of French food culture. The French Food Spirit Awards, unique in France and abroad, honor the achievements of people from other countries who have carried exceptional activities that exemplify the French Food Spirit as defined in its charter: a sense of freedom, of nature, of responsibility, of enterprise, of science, and of global duty. The recipients were selected out of 175 from over 40 countries of all continents, in the fields of artistic creation, scientific and academic work, and innovation in business, all of which contribute to the understanding of French food culture and the values on which Food Spirit is founded: pleasure and conviviality, overall well-being and physical health, quality, safety, and accessibility. Meryl Streep (Culture Award) for her outstanding performance in the movie “Julie & Julia”. The jury concluded that her role in Nora Ephron’s film is a tribute to everyday French gastronomy. Julia Child, graduate of Le Cordon Bleu Paris, author of the "Mastering the Art of French Cooking" and pioneer of American TV culinary shows, became in the 1960's an enthusiast of promoting French cuisine and food culture. Paola Bonfante (Science Award), professor of botany at the department of Plant Biology of the University of Turin, who has worked on the sequencing of the genome of the Black Truffle of Perigord within a European research team headed by Professor Francis Martin of the French Institute of Agronomy Research.This mycorrhizal fungus is part of the French food culture. Max McCalman (Entrepreneurship Award), created the legendary cheese program at New York City Picholine Restaurant. As Maître Fromager, in the US and worlwide, he is an advocate of artisanal cheese production. He is a lecturer and teacher at several top culinary schools. He is the author of reference books about cheeses. Ariane Daguin: (Special Jury Award) Founder and CEO of D’Artagnan Inc. This top quality pork and poultry products firm headquartered in New York, was created 25 years ago. Ariane Daguin was the first to start producing foie gras in the US where she was a fierce advocate for this traditional French delicatessen. The jury 2010 is composed of 12 prominent members, all voluntary, independent and drawn from all fields of endeavor: Gerard d'Aboville, navigator and member of the City of Paris Council, Jim Bittermann, American journalist, senior correspondent for CNN, the conductor William Christie, François-Xavier Demaison, French actor, Claude Fischler, sociologist, Jean-Pierre de Launoit, president of the Fondation Alliance Francaise, Astrid Lulling, from Luxembourg European Parliament quaestor, the Japanese essayist and journalist, Keiko Minamitani, Sonia Poussin, photographer-director author of Africa Trek, Stanley Prusiner, American virologist and Nobel Prize in medicine, the French chemist, Hervé This and Bertrand du Vignaud, President of the World Monuments Fund Europe. Partners of The French Food Spirit Awards 2010 are Cofigeo, Daum, Hénaff, Le Cordon Bleu, Mazars, Sopexa and Tempé.